The most remarkable difference between Civil War and previous MCU films is an acknowledgment of “collateral damage”—innocent people who die as the Avengers attempt to fight bad guys. The Captain America films are the crux of Marvel’s Cinematic Universe. The opening film saw the introduction of MCU’s first superhero, the second saw the downfall of SHIELD from HYDRA operatives within its ranks, and now it seems the Avengers themselves are beginning to crumple. Although Civil War is a direct sequel to The Winter Soldier, it also serves as a touchpoint for most of Marvel’s other characters, involving so many that months ago it had been labeled The Avengers 2 ½ by fans. There is rampant disagreement in the ranks of this gang of heroes, and there may be just reasons on both sides to part ways with Captain America (Chris Evan) and Iron Man (Robert Downey Jr) splitting the leadership. One hopes that, even in separating, the future will be brighter, both for them and ourselves. In a cruel twist of fate, Captain America’s best war buddy, Bucky Barnes (Sebastian Stan), has been turned into the Winter Soldier by HYDRA and now carries out assassinations against his own will through mind control. While Captain understands the need to stop the Winter Soldier’s acts of terror, he also has good reasons to believe his fellow Avengers would kill him rather than try to fix his skewed brain. After the disastrous fallout from previous battles, the world feels the need to reign in the power of these “advanced humans.” The United Nations creates the Sokovia Accords, which would place the Avengers under direct civilian control of an international committee, deciding when or if they should and could intervene in world affairs. Captain America is the most vocal opponent of this measure, but Iron Man and others feel it is long due. When Bucky reappears, Captain goes rogue to save this one friend, even if it means fighting all his other comrades. The most remarkable difference between Civil War and previous MCU films is an acknowledgment of “collateral damage”—innocent people who die as the Avengers attempt to fight bad guys. Iron Man is especially hurt when he meets the grieving mother of a late soldier who was killed in Age of Ultron. Captain America is the most accepting of this harsh truth. War always means good people die, but the alternative is not fighting at all, even when necessary. This conversation is an important one but is difficult to manage in the superhero genre which operates as archetypal fantasy. Obviously, if the city wide battles were real, there would be thousands of civilian casualties, but this would make it nearly impossible to see the good in our heroes. Such a discussion is better left to realistic war films like Platoon or Saving Private Ryan. Although Civil War does a good balancing act for a while, it eventually falls back into pattern soon into the second act. “Although we fight evil,” Vision observes, “our might also invites challenge.” Coming from the greatest generation, who knows personally the dangers of freely giving authority to outside forces, Captain America refuses. “What if we don’t like where they send us,” he muses. “Or if they won’t let us fight.” This mirrors a debate that is at the heart of the American experience. Captain prizes the right of individual conscience against an authoritarian state. Iron Man seeks safety in the collective consciousness of the common good. Both are needed to a degree, but it is the former marks America’s rather unique place in the history of mankind. This isn’t to say that the individual can do whatever he wants; Captain America is by far the most driven by the need to “do the right thing.” Rather, he understands that moral restrictions come from a credible moral code, not boardrooms and committees. Yet our dear hero is not perfect and is hiding a secret that deserves to be known. This secret unleashes terrible consequences, and by the end two of the superheroes are bent on murdering Barnes—not out of justice but revenge. The villain, too, is revealed not to be acting out a desire for power but out of hatred born from deep suffering. In the end, sin is the greatest enemy. War is sometimes just but it is never “good.” It is reasonable to bring Barnes in despite his lack of culpability, but he is a soul loved by God and must be treated as such. By far the most important aspect of Civil War was also the one thing it delivered best: watching your favorite heroes duke it out. Behind this childish glee is an understanding that these characters don’t really hate each other and could never do any serious damage even if they did. All of them are “super,” so the fighting is pointless. 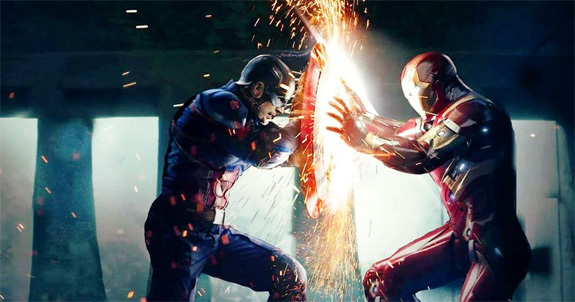 The joy lies in experiencing these exciting scenes of action and visual effects, and Civil War delivers plenty. All MCU film are at least fairly decent, some are pretty good, but those starring Captain America stand above the rest. He is a man out of our time yet the one our time needs the most: a brave hero who would rather do the right thing than the easy thing. You don’t require Super-Soldier serum to do that, just truth and grace.